Being an employee of Snooze, an AM Eatery, has its perks. Having a background in photography, I was asked to take some pictures of this amazing week-long event in one of the most beautiful spaces I've seen: The GrowHaus. Harvest Week is a culinary collaboration featuring amazing EatDenver restaurants. The Colorado-grown produce that sustains local restaurants is prominently featured. 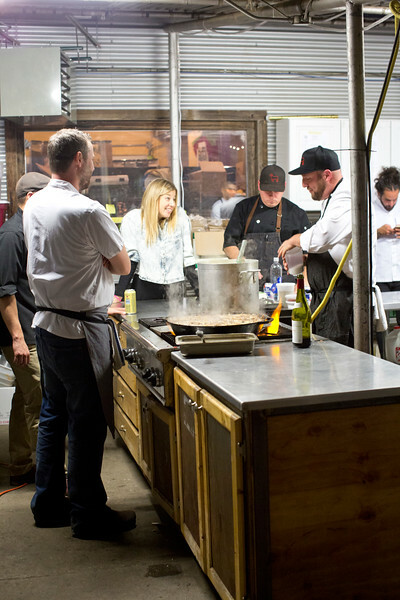 What's amazing is, a group of local restauranteurs partnered with EatDenver to work with local farmers, producers, brewers and so on to bring this creative and green experience to Denver foodies who eat with a conscience. In addition, using the GrowHaus, a nonprofit indoor farming operation in the city of Denver, for the space to host the event has brought awareness to the GrowHaus's mission: creating community-driven and neighborhood-based food systems. The GrowHaus is the only full-service grocery store in the Elyria-Swansea neighborhood, as well as a hub for food education, community programs, and low-income servicing for all families. I felt completely inspired and honored to be a part of something so humble, collaborative, and delicious! There was some serious talent being represented and mingling with both the front-of-house and back-of-house participants was as enlightening as the food and drink. Much gratitude for my job at Snooze for always opening up new opportunities. I am one lucky girl.